Beyond aesthetic applications, Botox is used to treat a variety of medical conditions, including eye squints and migraines. Botox is also used as a treatment to reduce the appearance of facial wrinkles and fine lines. A fat reduction injectable treatment that destroys fat cells in the treatment area under the chin to improve your profile. Volume incentive: Purchase 3 vials, get 4th vial half off. JUVÉDERM® collection of fillers adds volume to different areas of the face - without surgery. All four Juvéderm® products (Vollure XC, Volbella XC, Voluma XC, and Ultra Plus XC) are full retail price for the first two vials. Volume incentive: Purchase two vials, and buy the third vial at half price. Can mix and match. Half price item must be equal to or less than the two vial full price. At the discretion of the Doctor: $200 per site. to set up an appointment click here. Need financing? click here for care credit! In a city as large as Albuquerque, there are many choices available for one to choose from in the rapidly growing area of cosmetic and facial therapy. 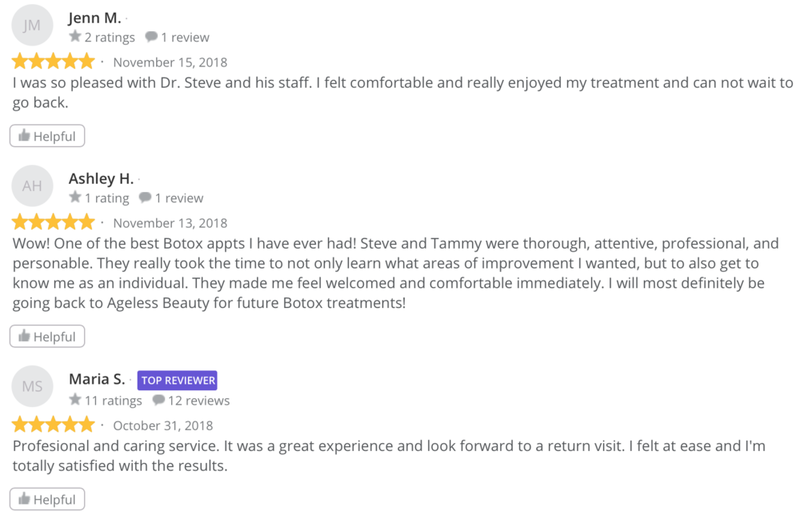 When one considers “botox and fillers” usually what comes to mind is a spa whereby a customer can meet with a specialist properly trained in this delivery modality, choose from a “menu” of treatment plans, and follow through with a specialist to receive the care that they desire. Steve and Tami are different. When you arrive at Ageless Beauty Therapeutics, you will be greeted by Steve Harrington, DDS, and Tammy Harrington, RN. There are no receptionists and no clinical assistants. Dr. Steve and Nurse Tammy will greet you and work with you personally. They have worked in the healthcare world for a combined total of 52 years. Steve, a native New Mexican, ran a very large and successful dental practice for 32 years and Tammy, originally from Ventura, California worked as a Labor and Delivery nurse for over 20 years. They understand what it takes to deliver large-scale healthcare to a large population. Now, the two of them have elected to scale down. They won’t overwhelm you with a large menu of choices. They have elected to do a few very effective treatments in the most effective way. And they do them very very well. Come and sit with Steve and Tami. You will leave with a much better idea of what it means to be happy with your face and your smile as well as everything underneath it all….the real you. After all…..you ARE beautiful. You deserve to know it. And so does the rest of the world. Fill out the form below. We are more than happy to help you!